The Year of the Hare by Arto Paasilinna is my book from Finland for the Read The World challenge. It makes something of a change: it’s short (130 pages!) and rather light. Most of the books I’ve read for this exercise have been rather serious novels about post-colonialism, dictatorship, the collapse of traditional cultures, civil war, the refugee experience and so on. Mainly no doubt because that was the C20th experience for so much of the world’s population, but also perhaps because of a translation bias: it’s the Serious Books which are most likely to find their way into English editions. So, although I have a reasonably high tolerance for that kind of thing, it’s still a nice change to read something which is, at least superficially, lighter. The Year of the Hare is the story of Vatanen, a journalist whose car hits a leveret; he finds it, splints its leg, and essentially goes walkabout with the hare for company, leaving his job and his wife to go and work in the Finnish countryside. The book has an episodic structure as Vatanen meets eccentric characters and gets caught up in mildly farcical adventures. People often come out rather badly, their chaotic and frequently ridiculous intrusions onto Vatanen’s life in contrast to the constant, quiet presence of the hare, and the book is clearly among other things a satire and a book about solitariness and being in Nature. But I don’t want to overburden it with interpretation: I enjoyed it. I recommend it. 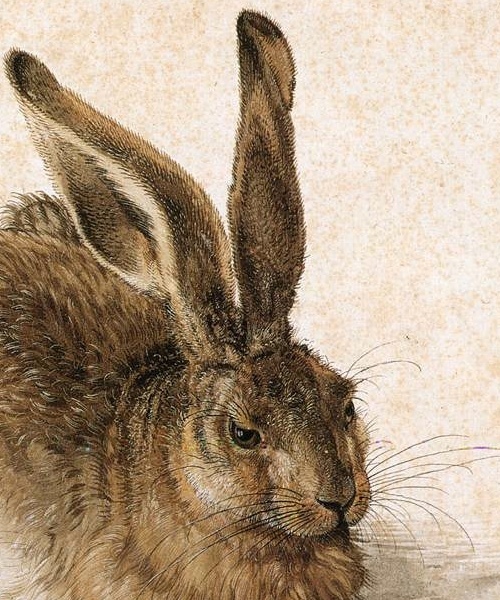 » The picture is of course Albrecht Dürer’s A Young Hare, taken from Wikipedia. The most obvious choice imaginable, but it’s such a nice picture.